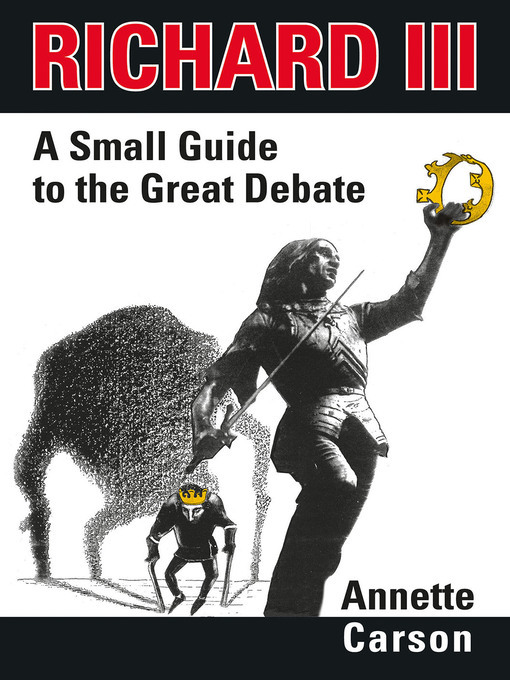 Ever since the discovery of his lost grave in Leicester, the eyes of the world have been drawn to the twists and turns surrounding England's King Richard III... Annette Carson, acclaimed author and expert on Richard's reign (and one of the team who found him), has published A Small Guide to the Great Debate, a brief summary of the main arguments concerning his actions and reputation. Carson has researched and written extensively on Richard III. Her book Richard III: The Maligned King (The History Press, 2008) was revised in 2013 and sold out within 3 months. The print edition of A Small Guide was published on 1 July this year and is already stocked, in hundreds, by visitors' centres at Leicester, Bosworth Battlefield and elsewhere. Written as a succinct, straightforward summary of the facts, this short handbook outlines how King Richard came to be portrayed as a monster-villain by the Tudors, and how a backlash in later centuries created the 'Great Debate' over his reputation, which still rages today. It also analyses the mystery of the 'Princes in the Tower', examining what people actually said and did at the time of their disappearance, and who profited from their removal. The book sets out all the main theories and arguments, together with their strengths and weaknesses, in a non-scholarly style, without imposing judgements and conclusions. An invaluable reference resource, it invites readers to weigh up the evidence and make up their own minds. Recommended for anyone interested in Richard III, for libraries and also as a reference for the media, A Small Guide sticks to the verifiable facts while offering insights you won't find in conventional history books.